Every girl aspires to look breathtakingly beautiful on her D-Day. It is the day when she wishes to look her best to keep all the eyes on her!! Choosing the right outfit is, hence, very essential for that perfect look. 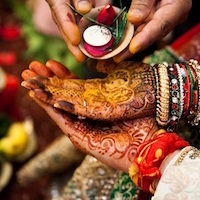 Who else can help the soon to be brides, other than our B-Town celebs. They never fail to mesmerise all on their wedding day with perfect makeup, trendy yet unique outfits and classy jewellery. 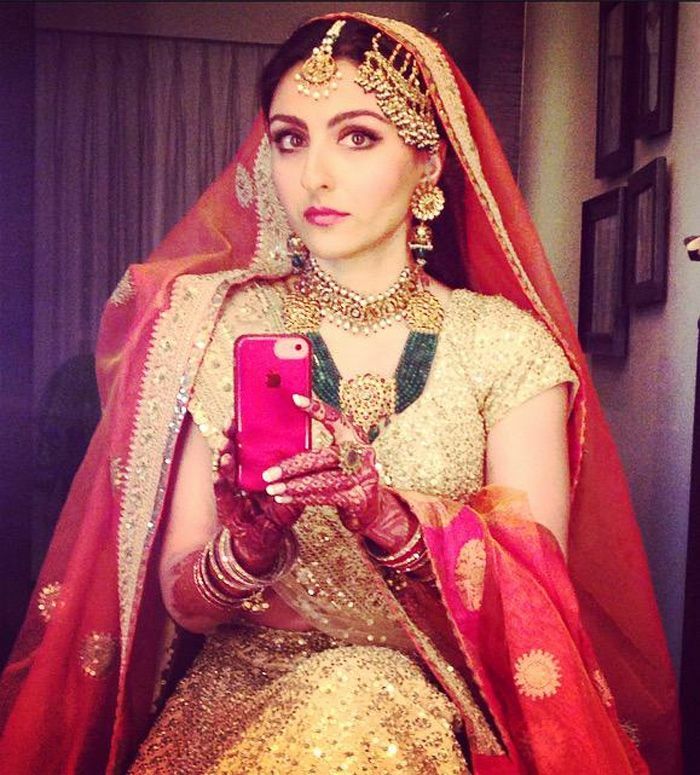 Let’s have a look at some of the stunning Bollywood beauties in lehenga on their wedding day. If you are going to be a bride soon, then, these celebrity outfits will surely help you choose the right lehenga for your D-Day, ceasing your dilemma! The top celebrity on our list will definitely be the gorgeous- Bipasha Basu. With the sparkling red lehenga, designed by none other than renown designer Sabyasachi, she looked perfect in every aspect. The heavy, detailed and minute golden work embellished all over the lehenga was the focus of the outfit. She perfectly contrasted the Punjabi lehenga with traditional Bengali makeup and accessories. Her outfit is indeed the one every girl dreams of wearing on her D-Day! With 8000 Swarovski crystals, heavy embroidery and a cost of whopping INR 50 lakhs, Shilpa Shetty’ s red saree-lehenga created quite a buzz. She mesmerised everyone by pairing the Tarun Tahiliani masterpiece with grand Kundan jewellery, uncut diamonds and beautifully crafted emeralds. It is rumoured that the designer himself later borrowed the lehenga to show-case. Shilpa, with her cute smile, is indeed on top of the most beautiful Bollywood beauties in lehenga that the world has witnessed. Kareena looked stunning in her mother-in-law, Sharmila Tagore’s wedding 'sharara' (a type of bridal lehenga) on her D-Day. The golden artwork engraved all over the lehenga gave it a royal touch. The matching grand jewellery completed her look with elegance. 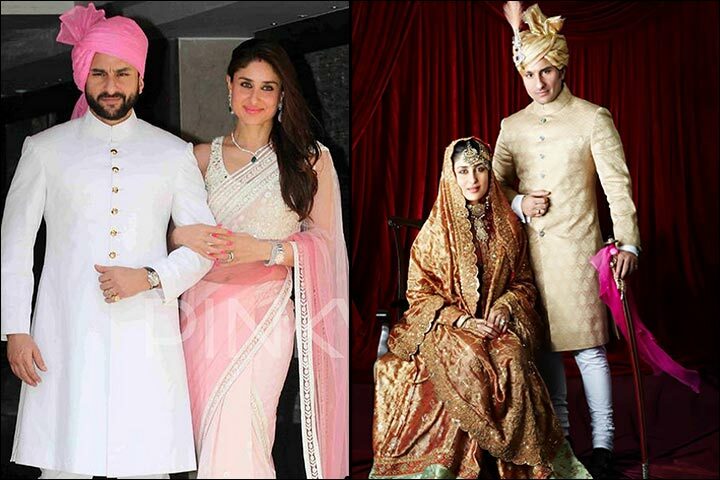 Kareena indeed looked picture perfect with hubby Saif Ali Khan in her grand bridal attire! Esha Deol looked gorgeous in the perfectly designed red and golden lehenga. She paired it with traditional gold and diamond jewellery. To match with her heavily designed outfit and grand accessories, she kept her makeup minimal. 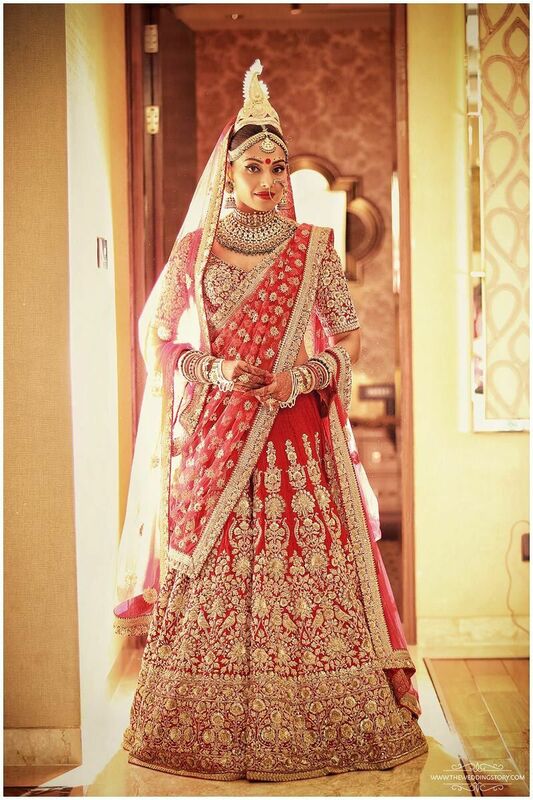 Esha indeed makes it to the top Bollywood beauties in lehenga whom every bride looks up to! 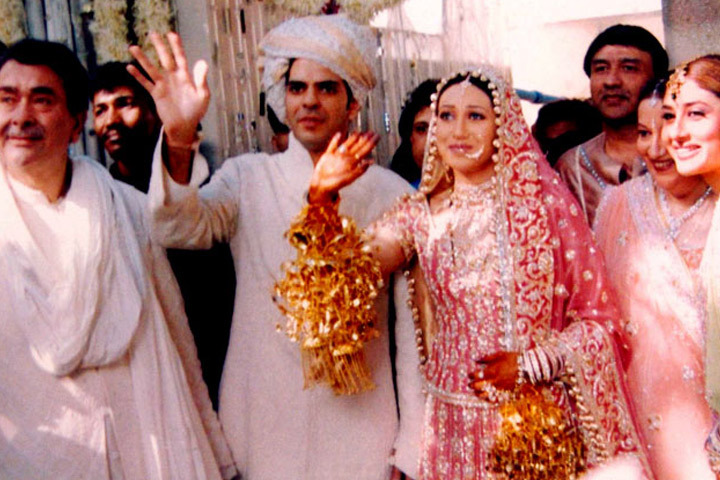 Karisma looked like a princess in her gorgeous pink lehenga designed by the mastero, Manish Malhotra. The 'Raja Hindustani' fame actress chose pink over red. She was indeed the early pioneer of unconventional bridal lehenga trend that has become so popular nowadays. Her bold makeup and diamond studded jewellery did total justice to her outfit. You cannot take your eyes off her, can you? Our favourite dimple girl rocked her D-Day with the beautiful red and golden lehenga. Preity spellbound all with her spectacular wedding look. Her heavy jewellery, grand lehenga and minimal makeup is still the talk of the town. Preity is one of the Bollywood beauties in lehenga who made everyone go wow!!! Soha, breaking the stereotype, chose a subtle off-white lehenga for her D-Day. To splash some colour on her outfit, she opted for an orange dupatta. She ensured to pair her simple yet classy dress with heavy traditional jewellery. The minimal makeup brought freshness to her overall look. The ‘Rangeela’ girl Urmila Matondkar shocked everyone with her intimate wedding. But what more astonishing was her beautiful red lehenga. With all the heavy golden floral work, she looked absolutely stunning in the classic Manish Malhotra creation. The traditional jewellery and subtle makeup perfectly complemented her look. She is one of the top Bollywood beauties in lehenga that let the internet go wild with her breath-taking wedding pictures!!! Dia chose to go for a unique green and cream colour lehenga for her most special day. The colour contrast of her lehenga is to die for! 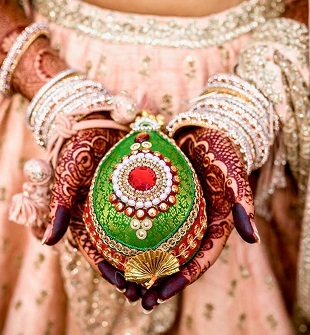 The bride looked nothing less than a queen with her matching gold and green jewellery. Her cute smile lifted the look even more! Gul Panag set the perfect example of a cool bride with her unconventional outfit and shades! 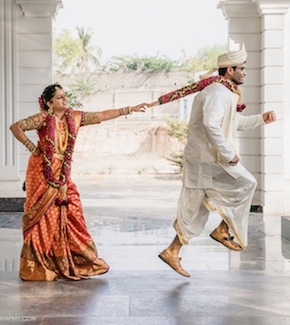 She opted for a pink lehenga for her wedding that she flaunted with cool glares. She paired her J J Valaya designed lehenga with beautifully crafted gold jewellery. She looked fresh and classy with minimalistic makeup. So, these were some of the most stunning outfits that our Bollywood celebs flaunted on their special day! All the Bollywood beauties in lehenga looked spectacular on their D-Day with the right outfit and complementing accessories. The soon to be brides out there, can really take inspiration from these celebrities while choosing the dream outfit and make their wedding a memory of a lifetime!